When I got home from school on Friday, I had a surprise package on the front porch. I got my Hot Mamas apron swap package from Val! I was so excited! I didn't expect it to arrive so early. She send such a wonderful gift - an adorable apron, hot sauce with the cutest crocheted sombrero and scarf, a dip bowl, some beads (she's from Louisiana), and some great recipes. I will post pics of it soon. Thanks for such a wonderful swap package, Val! I loved it! 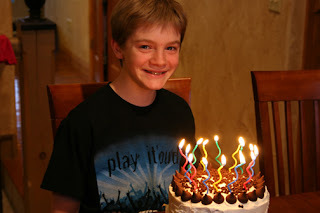 We celebrated Corey's 14th birthday (man, that makes me feel old) on Saturday with both sets of grandparents. He requested an ice cream cake for his party (chocolate cake with vanilla ice cream). I think it turned out pretty well. :) Believe it or not, it snowed on March 28! It was very pretty coming down, and because the ground was so warm, it didn't stick. This week is one of those nights we have lots of evening obligations, including Corey's Eagle Scout board of review. I'm doing most of my cooking for the week today so everything will be ready to heat up once we finally get home each evening. Here's our busy-family menu for the week. For more menu ideas, go to orgjunkie.com. You can't get much easier than this recipe! Put thechops in a crock pot, add 1-2 cans of golden mushroom soup (depending on how much gravy you want). Cook on low 7-8 hours. Serve gravy over chops. We're back from our cruise to Key West and Cozumel! We had a wonderful, relaxing vacation and loved the warm weather (it was 90 in Cozumel!). Now we are back to reality and are adjusting to life without 24 hour food service and having our rooms cleaned twice a day. ;) Be sure to check out our photos. I did manage to make myself a tote bag the day before we left for the cruise. It was the perfect bag for this trip. Gotta love all the pockets. :) I hope the others I made bags for recently enjoyed theirs as much as I enjoyed mine. Because we took full advantage of the constant food fest on our cruise, we will be doing some seriously healthy eating this week to get our bodies back to normal. :) I hope you enjoy the menu. For more menu ideas, visit orgjunkie.com. 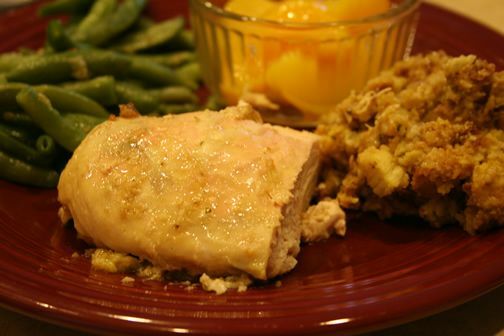 Place frozen chicken breasts in bottom of slow cooker. Add remaining ingredients except cream cheese. Cook on high for 4-5 hours. At this point, remove about 1/2 the liquid if you want the sauce thick, like a stew. You can leave all the liquid if you want a "soup". Add cream cheese, cook on warm setting for 30 minutes, then stir. Trim any fat from pork chops. Combine pork and next 6 ingredients in a zip-top plastic bag. Seal; marinate in refrigerator 8 hours or overnight. Remove pork from bag, reserving marinade. Prepare grill. 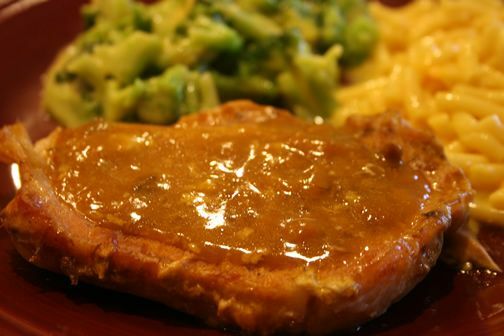 Place pork on rack coated with cooking spray; grill pork chops, turning and basting frequently with reserved marinade. When pork chops are about 8 minutes from being cooked, add pineapple to grill; grill pineapple until lightly browned, turning occasionally. This may not look like much, but it was an exceptionally tasty fish recipe. The hubby loved it. 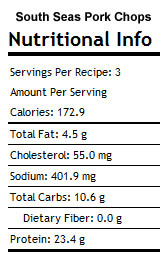 Combine all ingredients except cod in a large 1 gallon ziplock bag and mix well. Add cod and seal bag. Turn to coat thoroughly. Let marinate in refrigerator for 30 minutes. Heat oven to 425 degrees F. Place cod fillets in a foil lined baking pan. Discard bag and marinade. Bake fish at 425 degrees F. for 10 to 15 minutes or until fish flakes easily with the tines of a fork. I'm sorry to say, but my menu this week probably won't be that helpful to you. We are taking our summer vacation early and will be gone most of the week on a cruise to Cozumel! My house sitters will be cooking and eating at our house, but I have no clue what they will be eating, so I can't even share that with you. ;) Here's what we had during the equivalent week last year. Maybe that will give you some ideas. For what it's worth, here's my scant menu for this week. Next week I'll be able to share some vacation pictures and give you a normal menu. For more ideas see orgjunkie.com. Last week's new recipe hit were the onion beef cups. They were very tasty and filling, and they made great leftovers for lunches during the week. Here's this week's menu. For more menu ideas go to orgjunkie.com. Mix the ground beef, bread crumbs, onion powder and garlic powder. Make the meats small, about a teaspoon. Put on a rack on a baking sheet covered in foil and bake in a 400 degree oven for 20 minutes. Set aside. Put two cans of the chicken broth into a large soup pot. Mix the frozen spinach with the chicken broth until it is all unfrozen and separated. 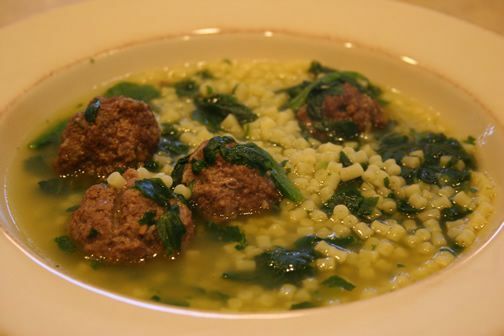 Put the meatballs in with the spinach and broth, set aside. Put the other can of broth in another pan, add a can of water, and some salt. Heat until boiling, and throw the pasta in. Cook until pasta is tender. Dump into the big soup pot with the rest of the soup, and stir over medium heat until simmering. Serve in small soup bowls and top with plenty of grated Parmesan and Romano cheese. I definitely felt more on top of things this week. My cold was under control and I pretty much stuck to the menu for the week. We did end up eating out on Saturday as we did an unexpetcted shopping trip for our spring break trip, so Saturday's meal ended up being our meal tonight. 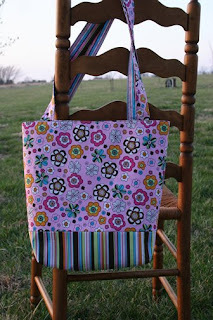 I also managed to finish two tote bags this week. I did end up having to take off an unexpected day off work to go to the periodontist (gum doctor). I have receding gums and have to have a gum graft done (man, that makes me feel old). :( Not that you really wanted to hear that, but I had the need to share my pain. Just a warning - don't brush your teeth too hard or your gums disappear! This week we have a couple of evening obligations (scouts and technology night at my school), and the boy travels on the weekend for his state math contest. That means seafood for me and the hubby on Friday when he's gone! 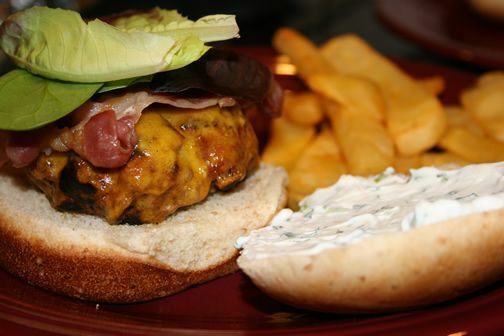 :) You'll see a couple of new recipes this week (the burgers and the soup). 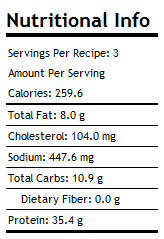 I've made the chicken recipe before, but I haven't posted it until now. Pictures will be up later in the week for the new ones. Here's this week's menu. For more menu ideas, see orgjunkie.com. This tastes just like the stuff you get at restaurants! Yum! Brown the sausage in a large Dutch oven or soup pot, crumbling as it cooks. Once the sausage is browned, remove it from the pot with a slotted spoon and discard any excess grease. Melt the tablespoon of butter in the pot. Add the onion, garlic, carrot and celery, and saute over medium heat until vegetables are soft, 8-10 minutes. (I usually blend the vegetables up with an immersion blender as the boys in my family don't like big veggie chunks). Return the sausage to the pot, add the can of diced tomatoes with juices, stir briefly, and simmer for 10 minutes. 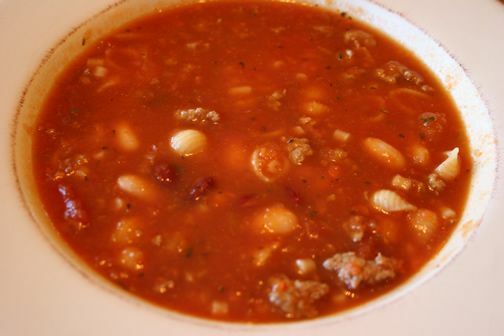 Add the beans, beef broth and tomato sauce to the pot. Add in all of the seasonings, stir well, increase the heat to high and bring to a boil. Once boiling, reduce the heat to low, cover and simmer at least 30 minutes. Add the dry pasta and continue to simmer on low for another 30 minutes. Serve. 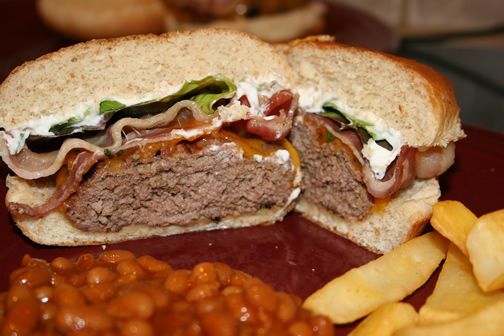 The horseradish gives these burgers a tasty kick, and the sauce makes it unique. In a large skillet, cook the bacon over medium-high heat until crisp. Drain on paper towels. In a medium bowl, combine the sirloin, Worcestershire sauce and horseradish; season with salt and pepper. Form into 4 patties. In skillet over medium high heat, add the beef patties and cook, turning once, for 8 minutes for medium (or cook on grill - my preferred method). Melt the cheese on top of the patties during the last 2 minutes of cooking. Meanwhile, in a medium bowl, combine the sour cream, parsley, chives, and lots of pepper. Place the cheeseburgers on the roll bottoms and top each with 2 slices bacon and some arugula or spinach leaves. Slather the bun tops with the sour cream sauce and set into place. This recipe is perfect for busy nights when you need supper to be ready when you get home from work. We're Back from Spring Break!